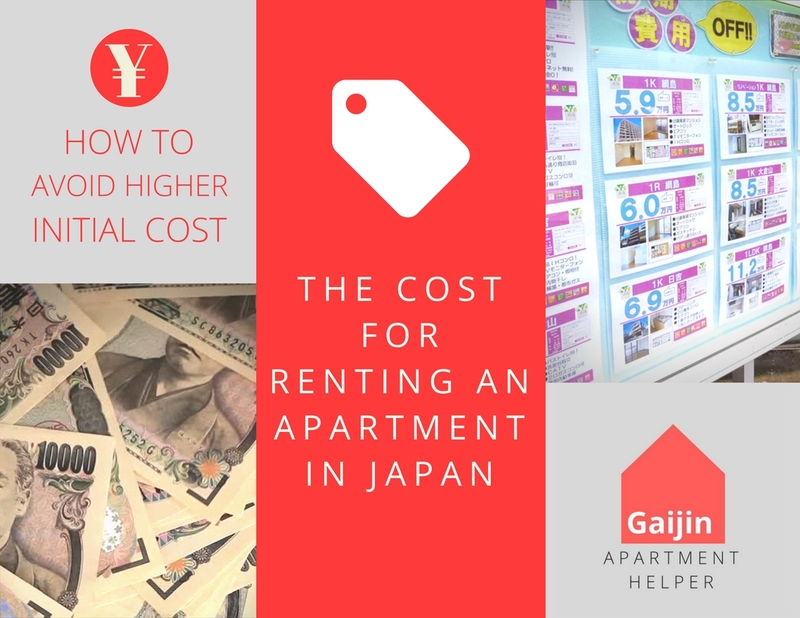 The cost for renting an apartment in Japan depends on which city you are planning to live in. For example Osaka or Yokohama is usually much cheaper than Tokyo. When people complain about the cost for apartments in Japan. They are usually referring to the upfront cost. Here we are going to explain all of this and more. the average rent for a one bedroom apartment in Osaka will be around ¥50,000 or $500 a month. The size for that price will be anywhere from 20 to 30 m². For that same type of apartment in Tokyo however that price will go up. The average cost for a one bedroom apartment in Tokyo is around ¥80,000 a month. There are cheaper apartments out there of course. These prices that were mentioned can be lowered to be about 35% cheaper in both cites. However the price will affect the quality, size and location. Usually there is also a maintenance fee charged to your monthly payments. The maintenance cost usually starts at ¥3,000 a month and can go up from there depending on the apartment. Japan is one of the most expensive countries for land per square meter. Most people understand the limited amount of space and expect Japanese apartments to be smaller. What people do not expect however is the expensive initial cost that comes with renting an apartment in Japan. Although the rent for apartments in Japan is about 30% less expensive by average than the United States. The initial cost however can be much more expensive. An average upfront payment in Japan is usually five times the rent. This is including the rent it self. A good deal is considered to be around three times the rent or lower. However some larger apartments for example a three bedroom or 3LDK. Also if you have a pet in some cases will result in a higher upfront cost. Below we will explain the reason for the upfront cost. Also give you some tips on how to avoid some of these fees and what to look out for. Here are some examples of the upfront cost in Japan. In some cases it's possible to have an apartment with less fees than what is listed below. However these fees are what you should expect in most cases. Also what you should plan for to have a reasonable selection in quality, size and location. Mostly related with larger apartments, pets or highly desired areas. These fees are the most common fees for an apartments upfront cost. To learn more about this you can take a look on our article about guarantors. This initial fee usually ranges from 50% to even 100% of the rent. The insurance for the apartment usually covers any water or fire damage. Usually starts at ¥20,000 and can go up from there depending on the apartment. About 99.9% of the time you will need a real estate agent to receive an apartment in Japan. The realtors cost is usually 100% of the rent. This is for them to clean the apartment after you leave. Usually starts at ¥20,000 and in some rare cases can even go up to 100% of the rent. These initial fees depend on the apartment. For example you might only see one or even none of these fees at all on your bill. However watch out for hidden fees. These are what usually can drive up the cost for an expensive initial payment. Key money is usually considered the most hated. To learn more about this fee you can take a look on our article about key money. The cost usually will be 100% of the rent. Deposits can be involved for example if you have a pet. Be aware that not all deposits are refundable. Again the cost usually will be 100% of the rent. These initial fees can be optional in some cases. If the initial cost is high or the apartment is not highly desirable. Than these fees are the most likely that you can negotiate off your bill. Again it's possible that you might see only one or none of these fees at all. However watch out for hidden fees. This is to change all the locks to feel comfortable knowing that you have the only key. Usually starts at ¥20,000 and can go up from there depending on the apartment. This initial fee is for support for example receiving help when your locked out of your apartment. The cost starts at about ¥15,000 and can go up from there. This is for them to fog the room so you won't have any problems with insects. The cost starts at about ¥15,000 or much higher depending on the apartment. Although most apartments are on one single database which all realtors have access to. A very few amount of realtors have a few special deals that can only be available through them. Here at Gaijin Apartment Helper we offer many of these deals to make the upfront cost cheaper. If you do not go through our services here are a few tips. Find a realtor that you can trust. Do your homework to know a good deal when you see it. Don't be fooled by hidden fees or tricky tactics. Don't be too picky in quality, size or location. For example don't limit your search in one certain area or station. You could also try to negotiate the price down. However this usually only works with apartments that already have a higher price or an apartment that is less desirable. Hidden fees are extremely common with most apartment listings in Japan. Usually the listing will not show the total initial cost. Instead will only show a few of the fees or just list the fees that are not involved. It's very common to see an apartment advertised with no key money for example. If the listing has hidden fees which is usually the case. The only way to find out the total cost. Is to either give the realtor a call or go to the realtors in person. There are many different tactics that realtors use to either get you to see the apartment or to lure you into their shops. Before I mention these tactics to you please understand that there are many good realtors out there. These tactics are only used by a few and give the industry a bad name. It's simply something that you should watch out for. One tactic is that they post fake apartments. The reason for this is to lure you into their shops. If the apartment is fake the realtor can come up with all sorts of excuses why the apartment is no longer available. Than they will try to push other more expensive apartments on to you. Fake apartments are pretty hard to spot but we have found a few post that are a bit too obvious. This problem is only getting worse. Some realtors are actually going as far as to advertise that they do not take part in this. Another tactic is to advertise an apartment with no key money. Because this fee is the most hated and well known realtors will sometimes use this against you. An apartment with no key money will not necessarily mean it will be a better deal or less expensive. There can be many other fees involved that can drive up the cost. Here at Gaijin apartment helper we have no hidden fees. The apartments that we offer have a much lower initial cost than average. Take a look at our apartment listings. We have great deals on apartments for rent in Japan.